Preheat the oven to 180C / Fan 160C / Gas 4. Grease a 12 x 9 traybake tin and line with parchment. Peel, core and thinly slice the apples. Measure the flour, baking powder and sugar into a large bowl. Beat the eggs together with the almond extract and stir into the flour with the melted butter. Whisk, then spread half the mixture into the baking tin. Arrange the apples over the cake mixture before carefully topping with the rest of the mixture. Sprinkle over the almonds and bake for about an hour, or until the cake is golden, firm to the touch and a knife comes out clean. Leave to cool for 15 minutes, then turn out onto a wire rack and remove the parchment. This is best served warm with cream or ice cream, but is equally yummy at room temperature. I made this last weekend and was super impressed with how easy it was, and how blimmin' tasty it is! No, it's not diet-friendly (... apples are healthy though, right?) but it sure is worth the cals. Taken from Mary Berry's Baking Bible. Oh man this looks so delicious! 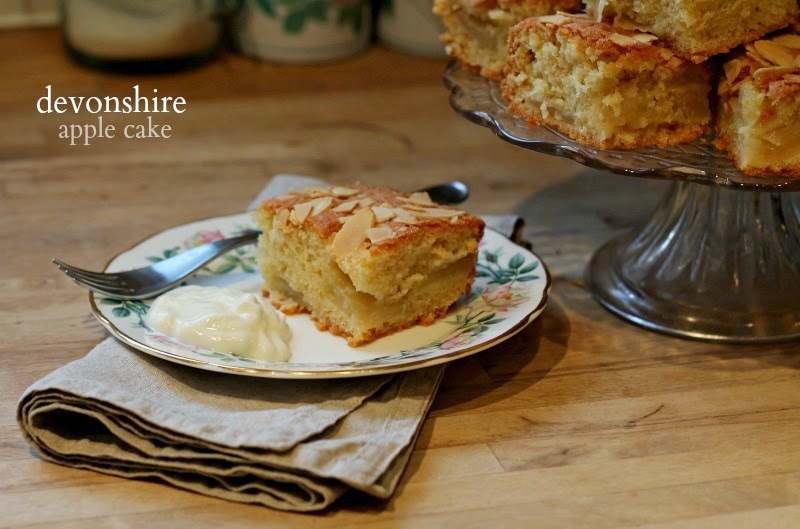 I love apple cake but have never made it, I must try and do it sometime :) it sounds so easy! Ah gosh I need a slice of this now!